New team captain for Smackdown’s women’s match Naomi is backstage with her teammates, Carmella, Asuka, & Sonya Deville talking about who their fifth and final member is going to be now that Charlotte has been inserted into the match with Ronda Rousey. Naomi announces that Mandy Rose is the new choice. Newly appointed Team Captain @NaomiWWE welcomes @WWE_MandyRose to Team #SDLive! The New Day is out first, and they say that tonight, they will have Smackdown vs. Team Raw. The crowd boos at the mention of Raw. Woods says Raw again, and the crowd boos again. He says Raw again, and the crowd Boos. They proceed to introduce each team, one by one, lastly with the Usos. Kalisto and Epico from their respective teams start this off. Collar and Elbow tie up to start and Epico has the advantage early. Kalisto gets a standing stalling vertical suplex early, but Kalisto kicks out of a pinning attempt. Epico follows up with a side suplex, and then tags him Primo who slingshots himself onto Kalisto. Primo sweeps the leg, but Kalisto tries to battle his way free and then tags in Scott Dawson. Dawson tags in Wilder and the two immediately hit the Shatter Machine on Primo, and the Colons are immediately eliminated. Karl Anderson comes in and tries to even the odds, but Bo Dallas is tagged in and he hits a clothesline on Anderson. Anderson Irish whips Dallas into the corner and he’s caught by Gallows and then rolled up by Anderson to pick up the three count. The B-Team is eliminated, and its now down to 8 on 8. Gable comes in and so does Big E and the two start to circle the ring and size each other up but Killian Dain tags himself in. He starts to go at it with Gable and tags in Eric Young, but Gable tags in Bobby Roode. Roode hits a neck breaker at the same time that Gable moonsaults off the top rope and they eliminate Eric Young and with him, SAnitY. Viktor is tagged in from team Raw and in comes Big E. Big E takes it to Viktor and Woods picks up Big E and slams him onto Viktor, and the Ascension is eliminated. Lince Dorado comes in now and so does Luke Gallows. Gallows and Anderson are sent to the outside and Lince Dorado and Gran Metalik (because apparently he replaced Kalisto?) land incredible top rope Asai Moonsaults. Gran Metalik hits a springboard senton and he pins Karl Anderson and eliminates Anderson & Gallows. The Usos come in and pretty much immediately eliminate the Lucha House Party. Now the real match starts, as we are left with The Revival & Gable/Roode vs. The New Day & The Usos. In first is Big E and Chad Gable and Gable goes insane and hits an overhead T-Bone suplex to Big E! He deadlifts him and hits the German into a neck breaker from Bobby Roode. We have chaos, which leads everyone to the outside. Dash WIlder tries to get in the ring but Big E hits his through the rope spear and bodies are laying everywhere. Jey Uso and Chad Gable find themselves on the top rope and Gable German Suplexes Jey to the outside onto everyone! OH MY GOD. Chad Gable and Big E are back in the ring and Chad Gable and Gable gets to the top rope and tries for another moonsault, but Big E catches him, and Xavier Woods gets on the top rope and they hit the Midnight Hour to eliminate the team captains of Monday Night Raw. Woods is in now and he hits Dawson with a punch, knocking him down in the one side of the ring. He climbs to the other side and tightrope walks to his his elbow, but instead, Dash Wilder comes in and Dash & Dawson catch him in the Shatter Machine to eliminate The New Day!! 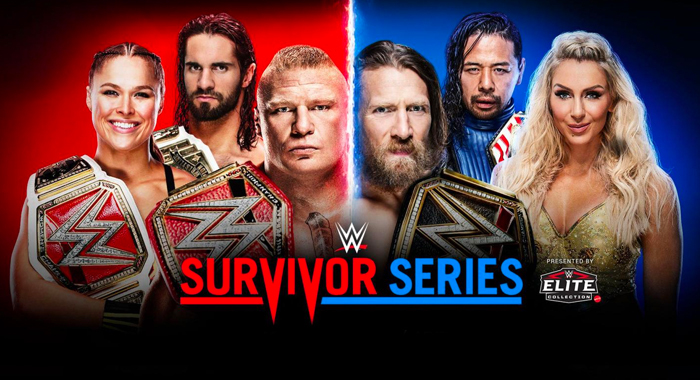 It is now just The Revival vs. The Usos, and the two go at it right away. They hit double super kicks on Dawson and then on Dash. Jimmy Uso jumps up on the top rope and hit the splash to pick up the victory for team Blue!